Those who use a smartphone with a wireless charging function or wish to upgrade their smartphone with this technology can now also use this comfortable charging method in BMW vehicles. The snap-in wireless charging adapter available as an original BMW accessory offers wireless charging, whilst serving as a safe and stable storage system for the mobile phone. An integrated LED display provides continuous information on the charging process and the status of the mobile phone when it is not in use. The stainless steel/matt black plastic retaining clip ensures that the mobile phone is held firmly in place. The rubberized underside of the retaining clip protects the display from scratches. The inductive connection with the external aerial guarantees optimum network coverage and reduces the level of radiation inside the car. The snap-in wireless charging adapter can be used in all BMW vehicles fitted with a base plate. Wireless charging also for the Apple iPhone. The new wireless charging case from the original BMW accessory range permits wireless charging of Apple iPhones (5, 5S, 6 and 6 Plus) in the new BMW 7 Series with the wireless charging option or in all other BMW models with the snap-in wireless charging adapter. 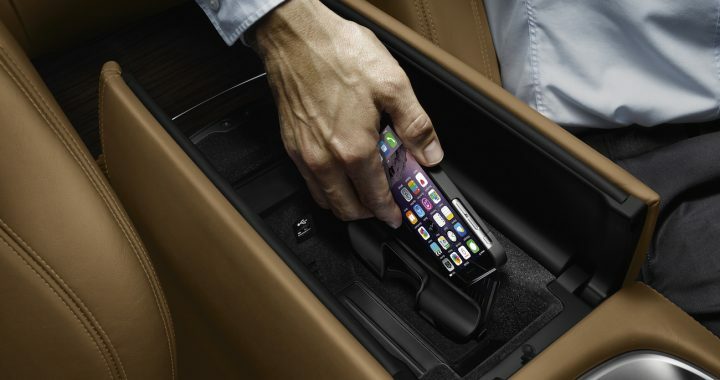 The attractive wireless charging case in BMW design is a one-piece unit with a fold-up lid and is used in a similar way to a conventional mobile phone protective case. When the iPhone is put into the case, it is compatible with all Qi-certified chargers – whether at home, at the office or out and about.